In today's tough economy, it can be difficult to shell out money on your hair, nails, and makeup. Fortunately, you don't have to spend a fortune to look like a million bucks. Try these simple, effective ways to save money on beauty, beyond just the coupons and store loyalty programs. In most cases, a smaller amount of product than you think is enough to get the desired results. For instance, you never need to use more than a nickel-sized amount of shampoo, conditioner, face wash, face moisturizer, or leave-in conditioner. Any more than that, and you're just wasting product (and money). The same goes for makeup; start small and build up your look. Not only will this save you money in the long run, but your lotions and makeup will last longer, so you don't have to replace them as often. If your makeup is still unexpired but in bad condition, you can probably breathe new life into it. For instance, by adding four to five eye drops into your mascara tube, it will re-moisturize the dried out wand and formula, making it work like new again. You can also place a closed tube of mascara into a cup of hot water to warm the solution and get a few more uses out it. Just make sure you throw your mascara away after three months of usage. You can also repair any broken eyeshadow or powder palette by simply reforming it with alcohol. Use lipstick as impromptu blush. Some of the best multitasking ingredients are oils (like coconut and argan oils), Vaseline, and baby powder. Multitasking products can help save you money because you can get the results of several products by just using one item. BB cream is the perfect example of a multitasker, because it can replace your sunscreen, serum, moisturizer, anti-aging products, and even your foundation. Your eyeshadow is another great example because it can also be used as an eyeliner, eyebrow powder, blush, highlighter, or bronzer. Eyeshadow can even be transformed into different shades of lip gloss and nail polish. Most drugstores and beauty stores will gladly accept your return. In fact, many stores (like Walgreens) pride themselves on the ease of their return policy, in the event that a certain shade of lipstick or foundation doesn't work on you. Not every shade or formulation of makeup will work for every person, so don't waste your money if you get home and decide it doesn't look right on you. Shopping for beauty products when everything is on sale will make you feel less guilty about your splurge. Certain items, like makeup sets, go on sale after the holidays, which would be a great time to stock up on whatever you think you might need for yourself or for future gifts. When you're down to the last bit of shampoo, conditioner, lotion, or makeup, it's time to get creative. You can cut the bottle open to scrape out any last bit, use a Q-tip to dig out any leftover foundation, or invest in an affordable beauty spatula so that you never have to throw out another drop. You can also use a damp makeup sponge to cut down on the amount of foundation applied. Ebates will give you cash back on certain purchases, including beauty buys. For instance, they offer 4% cash back on all Sephora purchases. If you gather up six empty MAC containers, they will recycle them for you and you can even pick out a free lip gloss as payment for your empties. Stores like Lush and Kiehl's offer similar programs. This trick can save you money on any makeup, clothing, or furniture purchases. It doesn't always work, but when it does, you'll be glad you waited the night. By putting items in your cart, but never completing the order, the store thinks you forgot about the items and will often send you an email reminder that you have items in your cart that need to be checked out. They will usually offer a promo code to entice you to complete the purchase, so you can save more on items that you already planning on purchasing. 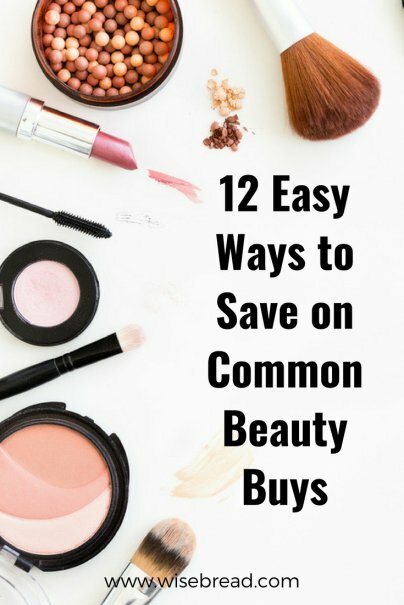 Do you know of other ways to save money on beauty? Please share your thoughts in the comments!